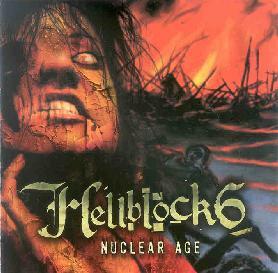 Hellblock 6 - "Nuclear Age"
This is one of the latest releases on the World Eater non-profit record label. All the CDs are $5 and 7" records $3 including postage! This CD was recorded in 15 hours sometime in 2002. The production is much cleaner and not as raw as on the other stuff I have heard on this label. This is very angry music (like Carnivore or Slayer) and a mixture of metal and doom but with more screaming angry vocals. Four of the nine tracks are over 6 minutes as the band pummels you into submission. "Go Die" is pretty punk rock inspired and only 2 minutes. "Damien" begins with a sample for a horror movie as the metal assault is unleashed. "Nuclear Age" slows things down as we get a more doomy sound with really insane effected vocals. "Lies of the Eyes" begins with an acoustic intro mixed with some samples before intense metal onslaught, not unlike Slayer. "Sunday" is a slow DOOM metal track and mostly instrumental with some great acid guitar soloing, which you don't hear on any of the other tracks. This was a studio jam that they captured in that 15 hour session that became this CD. Cool stuff. "Coma" is back to headbanging stuff! The CD closes with the 7½ minute "Oblivion", which is a basically instrumental acoustic track. A very diverse CD and the bands second. Also check out their CD, Burnin' Doom. For more information you can visit the Worldeater Records web site at: http://www.worldeaterrecords.com. Contact via snail mail c/o Worldeater Records; PO Box 42728; Philadelphia PA 19101.